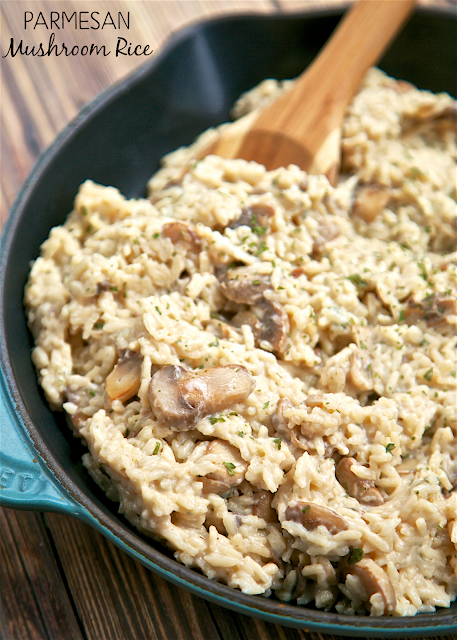 Parmesan Mushroom Rice - ready in 20 minutes! You'll never use the boxed stuff again! Rice, mushrooms garlic, chicken broth, milk, parmesan cheese and parsley. So easy and SOOOO delicious! 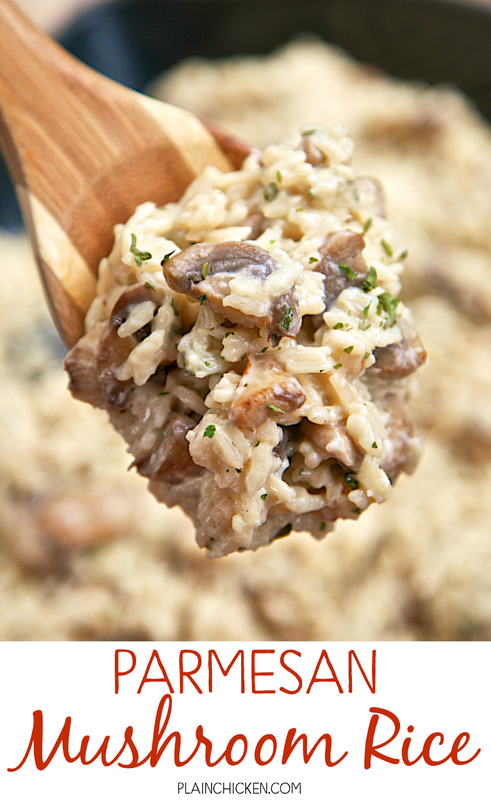 You can leave out the mushrooms if you don't like them - great either way. I love easy side dishes. I usually spend so much time on the main dish, that I don't want to fool too much with the sides. I am guilty of pulling out a box of rice or pasta. I am trying to get better and make more sides from scratch! 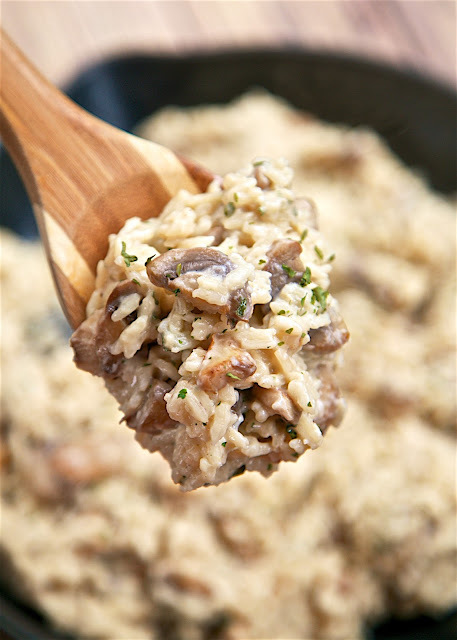 This easy recipe for Parmesan Mushroom Rice is just as easy as the boxed stuff but tastes SO much better! 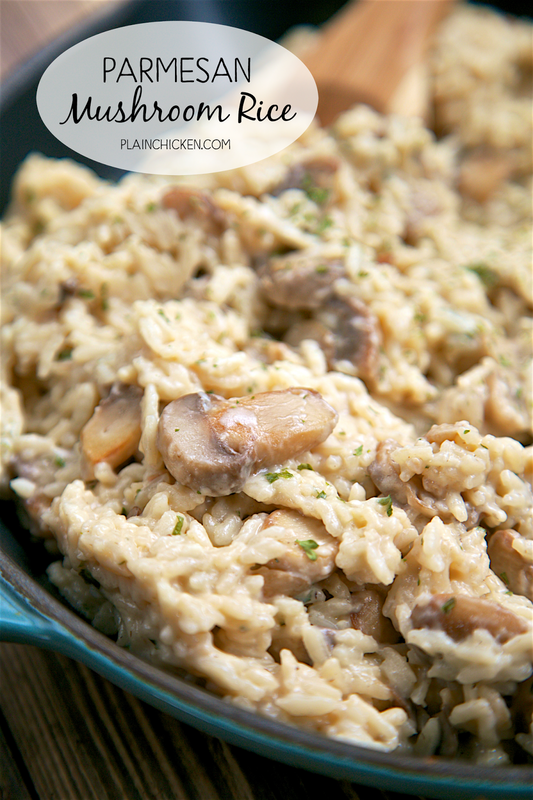 This Parmesan Mushroom Rice was ready in about 20 minutes and only required about 5 minutes of hands on time to make. I sautéed the mushrooms, added the garlic, rice, chicken broth and milk, let it simmer and then stirred in the cheese and parsley. So easy and SOOO delicious! If you aren't fans of mushrooms, you can definitely leave them out. This rice will taste great either way. In a large skillet over medium-high heat, melt butter. Add mushrooms and cook until soft, about 5 minutes. Add garlic and rice; cook for 2 minutes. Add chicken broth, milk and salt. Cover and simmer for 20 minutes, until liquid is absorbed and rice is tender. Remove from heat. Stir in parmesan cheese, parsley and pepper. You may need to add more milk if rice isn't creamy enough. I made this without the butter, cooked portabella's ( more flavor) in olive oil, at the end I added grilled chicken cut up in bite size pieces..We found it a bit bland.so I added some sauteed red onion & roasted red peppers..yum!! I am a huge fan of this recipe, with only a few amendments: it needs more salt, and at the end of the recipe, add lemon juice. It highlights the other flavors, and it's fantastic. Also, I recommend using basmati rice, which makes most rice-related things better. I love that it can all be made in one pot, and is good enough to be the main dish in my opinion. Particularly so if good, thick mushroom pieces are used. The better the mushroom, the better the dish, though it's still good with canned mushrooms, and that says something. In fact, I have a pot of it on my stove at this moment.